Ariki, Ngāti Maniapoto, participated in the Winter Programme at Toulouse Business School in France. Ariki is pursuing a Bachelor of Global Studies and Bachelor of Commerce conjoint degree at the University of Auckland. 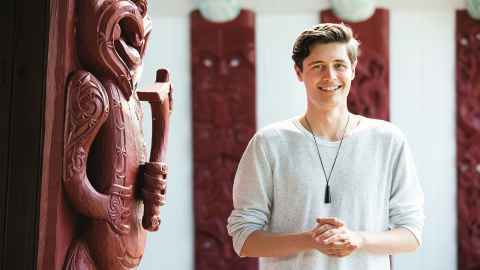 He is the recipient of a 360 International Award for Māori and Pacific Students. “My time at Toulouse Business School (TBS) has complemented my studies at the University of Auckland. As a short-term opportunity I found it quite a different style to lectures here – much more interactive and practical. I see overseas study as an asset that will make my degree more valuable. It gave me the opportunity to combine both sides of my conjoint, which has allowed me to specialise my degree further. Doing the TBS programme has helped me define a topic area for my Bachelor of Global Studies thesis that I would not have otherwise picked." The TBS winter school is a perfect opportunity for people who don’t necessarily have the time or money to do a full-time exchange. TBS offered constant support for the duration of the programme with a contact person who was able to help us with any problems we might have, whether it be academic, health, or language issues. “For me, the best thing about studying overseas was the people. My programme consisted of four to five weeks together with 20 students travelling across France, which meant that by the end of the programme we were one whanau who came from all corners of the world. It was fun to live in France and, even though it was only for a short time, I still got to do a range of true French things like going to the farmers market or making friends with locals. “Doing this short course reminded me that I came to University to get a degree that would be highly competitive within the international realm. I wasn’t considering doing a semester abroad before, but after doing the TBS winter school I have decided to apply for a full-semester exchange. “Whilst we are geographically isolated from global society, the age of instantaneous communication makes cross-cultural negotiation a necessity. Doing overseas study is a fun way to develop not only foreign language skills, but cultural empathy. So, if you can fit it into your degree, do it! Even a short course like I did will change you in ways you couldn’t anticipate.